On our first full day in Bahia, we explored the area around Praia do Forte. We began at the Atlantic Forest, where Ransly Familia '17 gave the group an overview of the forest. Ransly explained to us its history of exploitation and recent conservation efforts. Once inside, we learned more about the work currently being done at the forest to preserve and reclaim land that is the only home to several species of flora and fauna in the world. Walking through the forest, Trung Huynh '17 proclaimed, "This is like Mountain Day!" That is, until we came upon a sloth! Our guide on site explained that one of the sloths' top predators now are unfortunately humans, who are killing them and their habitat. Later on, reflecting about the day, Shannon Duffy '17 wrote that she appreciated she "got to hold the seeds and fruits of some of the trees which helped supplement the...knowledge passed on by our guide." Our next stop was the Castelo Garcia D'Acila Fortification. Dating back to the middle of the 16th century, it was the earliest Portuguese fortification in Brazil. In its chapel, the group spontaneously broke out in "Jerusalem" which you can hear above! 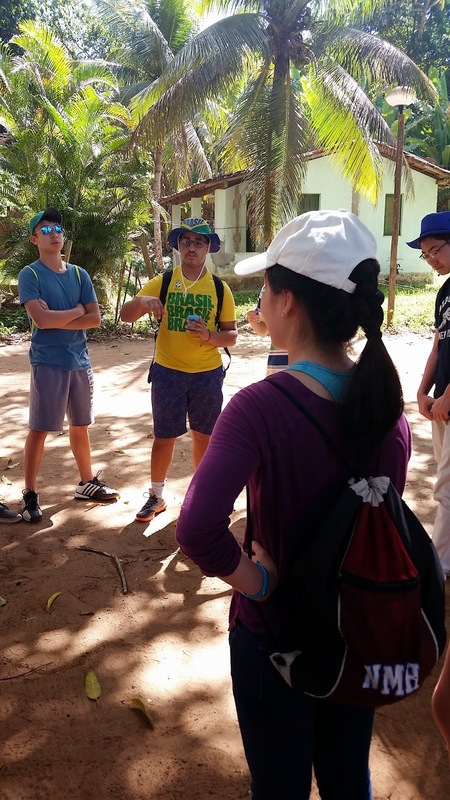 After Javier explained more about the magnificent site that was partly preserved and partly rebuilt, Lily Lin '17 had a natural classroom to discuss the history of indigenous populations in Brazil. After a quick rest, we were off to see the sea turtles! Specifically, we went down the street to visit the Tamar project, which has saved hundreds of thousands of sea turtles over the past few years. Once there, we learned how and why the turtles travels two to three thousand miles in three months. On our way out from the project, we were invited by our guide to visit his capoeira practice that night. So after dinner, the group took the road less traveled down to watch and then take part in the practice. A few of us were able to show off some skills! 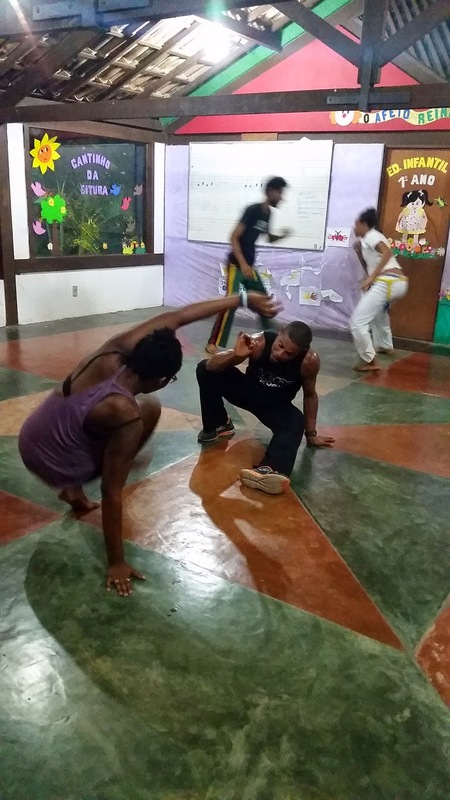 Chellandra Samuels trying an advanced technique! We finished the day by considering in what ways have we learned through the "Head, Heart, and Hand." ...we saw many things where our NMH skills come into use. But the thing that stood out to me was at the Projeto Tamar where you have an organization helping endangered sea turtles grow and be helped in their early childhood. 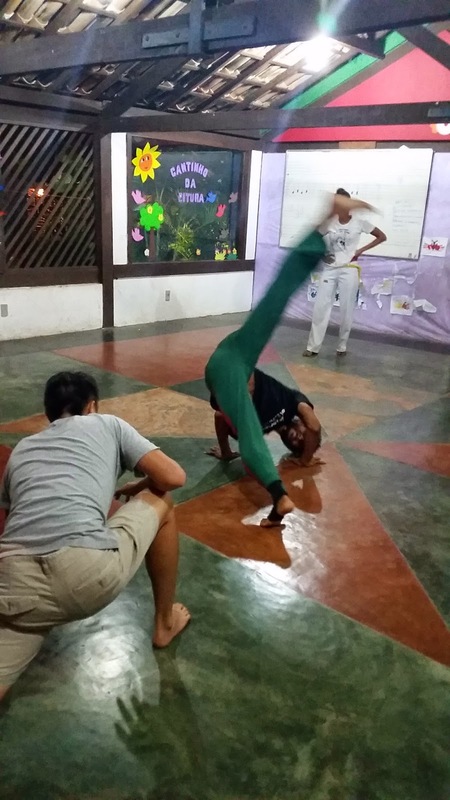 More importantly, I saw a kid helping the sea turtles and animals by feeding them and take care of them...Also Leo our guide invited us to his capoeira practice where he taught us moves and was kind enough to let us see their training. People within this community seem to use their hearts and hands to make this place better. The way of learning with the head, heart, and hand teaches us to use our intellect, compassion, and hard work to learn. The sea turtles in particular spoke to the compassion we are capable of. In visiting the old fort, we used our intellect to process the information given to us by our classmates and Javier. At the rainforest, our guide explained to us how they are growing new plants from seeds to replenish the forest. Here more than anywhere it has been impossible to learn using only one of the three. To fully experience and learn from Brazil, you must use you intellect, your compassion, and some elbow grease.